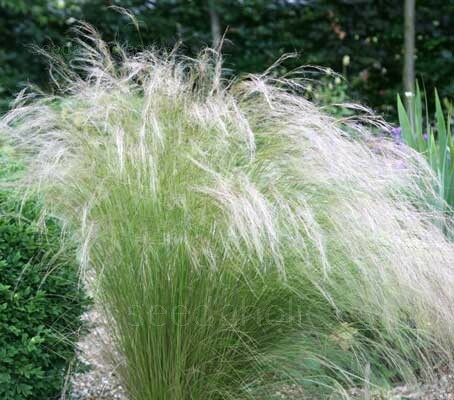 Stipa is a ‘must have’ for many garden designers. When a swathe of grass is called for, Stipa is drafted in with its feathery heads, adding movement and texture as they undulate in the wind. The silvery-white flower panicles make this grass a very attractive addition to the landscape. The plants are easy to grow in moderately fertile, medium moisture, well-drained soils in full sun. They can be used in borders or in meadows, used as ground covers, on slopes and for natural recovery. They can be planted as single isolated specimens or amongst perennials, in small groups, or in swathes. Ornamental grasses are easy to maintain and the rewards are great when grasses grace your landscape, adding colour, texture, and movement. Backlighting grasses is another excellent way to wake up the landscape. The awns can be cut and dried when first opened for use in winter arrangements indoors. Alternatively they make a useful winter food source for finches and other seed-eating birds. Sowing: Sow at anytime of year. Stipa germinates easily at temperatures of around 20ºC (68ºF), sow in spring or at other times of year keep at around 20ºC (68ºF). Sow the seeds finely in trays containing well drained soil, or sow in cells, 2 to 3 seeds per cell. Cover the seeds with a very fine layer of sieved soil. Seeds germinate in about two to four weeks but can occasionally be slower and irregular. Keep in cooler conditions after germination occurs. Germination to transplant usually takes around four to six weeks. Once the seedlings are large enough to handle, take a small clump and put them all in a one-litre pot containing a gritty compost. Plants in containers should be looked after carefully and not allowed to stand in full drip trays. They will form a bushy plant and be ready to go into the garden in summer. After hardening off, plant out after all risk of frost. Grow in sun and in well drained soil. The awns can be dried and make interesting focal or secondary flowers in dried arrangements. Cut the flower at the height of bloom and hang upside down in a cool, dark place to dry. Stipa capillata is a tufted perennial grass that is native to steppes and slopes in Europe and Asia. It is a perennial grass species in the family Poaceae, a huge genus of around 300 species. The species name capillata means 'hair-like'. The cultivar ‘Bridal Veil’ is also known as ‘Lace Veil’. Stipa are commonly referred to as feather grass after the large awns. The sharply pointed seeds of Stipa capillata give rise to the common name of needle grass. The fibres are also used to make high-quality paper often used in book manufacturing as well as very fine paper for rolling cigarettes. It is usually combined with five to ten percent wood pulp. The "Spanish" grade is usually regarded as the higher-quality, while the "Tripoli" grade, from Africa, is the lesser in quality. Bridal Veil, also known as Lace Veil.